Ketones are a beneficial product of fat metabolism in the body. When carbohydrate intake is restricted, it lowers blood sugar and insulin levels. As insulin levels fall and energy is needed, fatty acids flow from the fat cells into the bloodstream and are taken up by various cells and metabolized in a process called beta-oxidation. The end result of beta-oxidation is a molecule called acetyl-coA, and as more fatty acids are released and metabolized, acetyl-coA levels in the cells rise. This causes a sort of metabolic “feedback loop” which triggers liver cells to shunt excess acetyl-Coa into ketogenesis, or the making of ketone bodies. Once created, the liver dumps the ketone bodies into the blood stream and they are taken up by skeletal and heart muscle cells at rates of availability. In addition, the brain begins to use ketones as an alternate fuel when blood levels are high enough to cross the blood brain barrier. In times of starvation, or a low carbohydrate intake resulting in low insulin levels, ketone bodies supply up to 50% of the energy requirements for most body tissues, and up to 70% of the energy required by the brain. Glucose is the main source of fuel for neurons when the diet is high in carbohydrates. But when carbs are restricted, ketogenesis becomes the primary fuel process for most cells. During fasting or low carbohydrate intake, levels of ketone bodies in the blood stream can rise to levels between 0.5mM and 5 mM, depending on the amount of protein and carbohydrates consumed. This state is called nutritional ketosis. Contrary to what some medical professionals are taught, nutritional ketosis is not the same as ketoacidosis. Ketoacidosis is a dangerous condition associated with a lack of insulin in the body. Diabetics who don't inject or make enough insulin can experience ketoacidosis if an illness causes their blood sugars to rise above 200 mg/dL, and insufficient insulin is available. In these cases, diabetic ketoacidosis may occur. This is NOT nutritional ketosis. Ketoacidosis is a wildly out of control ketotic state in which blood levels of ketone bodies may rise above 10-25 mM. This type of metabolic derangement happens because there is no insulin to put the brakes on fat burning, and this results in a flood of fatty acids flowing out of fat cells, which are then converted to ketone bodies in the liver and dumped into the blood stream. These much higher levels of ketone bodies result in the blood pH becoming too acidic and causing the health issues associated with ketoacidosis. 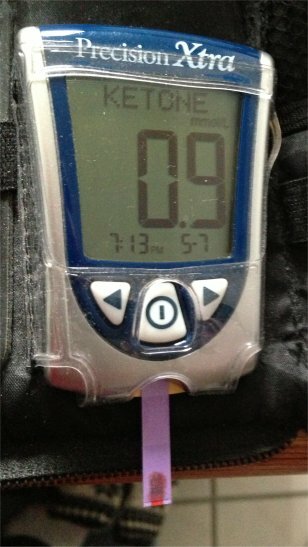 After a few weeks of adapting to a ketogenic diet, most people's blood ketone levels go above the 1 mM level. As the levels of ketone bodies rise, the brain begins to use more than half of them for fuel. In addition, the muscles of the body use all of the ketone body types. But after a few weeks of keto-adaptation, the muscles start converting the acetoacetate into β-hydroxybutyrate (BhoB) and returning it to circulation. Although BoHB is the more stable molecule, when it is taken up by muscle tissues, it has to be converted back to acetoacetate so that cells can metabolize it. The conversion between BHoB and Acetoacetate goes back and forth depending on where in the metabolism it is being used. The third type of ketone, acetone is very volatile and released in the breath and urine. However it also has some effects on brain signaling and it prevents neuron hyperexcitability, which may explain why being in ketosis can calm neurological conditions such as epilepsy. As time on a ketogenic diet progresses, the body becomes more efficient at using ketones for fuel. The kidneys adapt and get better at reabsorbing larger amounts of acetoacetate and the brain and muscles get more efficient in using circulating BoHB. This is important to know because the urine Ketone test strips that you buy in the drugstore only test for acetoacetate ketones. So the longer you are eating low carb, the less MEASURABLE ketone bodies will show up in your urine and on the Ketostix because the kidneys get better at absorbing them. In other words, it will seem like ketosis is slowing. However, at this point, your brain and muscles will be happily burning ketones for fuel, and as long as you stay under your carb sensitivity levels, you will be burning stored fat as your main energy source. The good news is that just recently, several companies have developed a blood meter to check for blood levels of BHoB at home. I've included links to these new products in the side bar at right. Note that the strips are pretty expensive. Other companies are working on a breath ketone analyzer, which may be cheaper, and have a better correlation to blood ketones as acetone is not filtered or reabsorbed by the lungs. For most people, eating more than 100 grams of protein along with more than 60-100 grams of carbohydrate on a daily basis will stop the process of ketogenesis and halt nutritional ketosis. Blood levels of ketone bodies will fall below levels which can be used efficiently by the brain. This is because protein in excess of body requirements is metabolized into glucose in the blood stream. About 56% of excess protein is metabolized into glucose, and this impacts ketosis as well. For others who are super sensitive to carbohydrate, eating more than 20 carbs and 80 grams of protein per day may interfere with ketosis as well. Here's a great video of Dr. Peter Attia talking about his experience with manipulating nutritional ketosis and his ketone levels. It's long but very informative, especially as the effect of exercise on ketosis. For more information about the chemical process of ketogenesis, this website is useful. Much of the information for this page was adapted from the book The Art and Science of Low Carbohydrate Living: An Expert Guide to Making the Life-Saving Benefits of Carbohydrate Restriction Sustainable and Enjoyable by Dr. Jeff Volek and Dr. Stephen Phinney. I highly recommend buying and reading it.